Providing you the best range of wind cup anemometer, wind data logger and wind velocity transmitter with effective & timely delivery. Aluminum and stainless steel are used throughout this instrument to ensure freedom from corrosion and long working life. A conical shield protects the spindle and bearing from the rain. An electro magnetic transducer connected to the vertical shaft gives pulses proportional to the number of rotations of the vertical shaft. Cup Anemometer manufacturer as per the client's requirement with industrial characteristics and features. Instantaneous value is compared with one/two Limit settings and gives visual indication as well as Relay output change over when the instantaneous value exceeds the set limit. Wind energy has been historically used directly to propel sailing ships or converted into mechanical energy for pumping water or grinding grain. Today's principal application of wind power is the generation of electricity. Wind data logger exporters, suppliers, manufacturers, traders and dealers in Mumbai, India to entire world since 1970. With 8000 mW of installed capacity, India is ranked fourth in the world in total wind power capacity. Wind farms have many turbines and each extracts some of the energy of wind. Usually sites are pre selected on basis of a wind atlas. Collection of site specific data for Wind Speed and Direction is crucial for determining the right site. 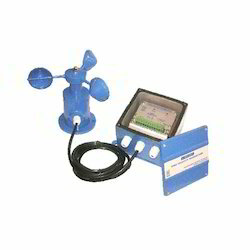 Wind data logger kit manufacturers, suppliers, dealers, traders as well as services in Mumbai, India and world. Wind data loggers are offered by us fulfil customers expectations because we design and deliver exactly as per clients instructions. Acd Wind Data Logger Vdl 09 Has Been Designed To Cater For The Need. Reading Wind Velocity & Direction data is monitored continuously. Bright Display allows user to note readings in poor light condition also. Logging Logger has capacity to store 2000 readings (Wind Velocity and Direction) with Date and Time. Export facility can store the data in excel sheet. Data management Software provided with the logger extracts data from the instrument and data information can be plotted in the form of line graph. Printer output Output for the printer is also provided.